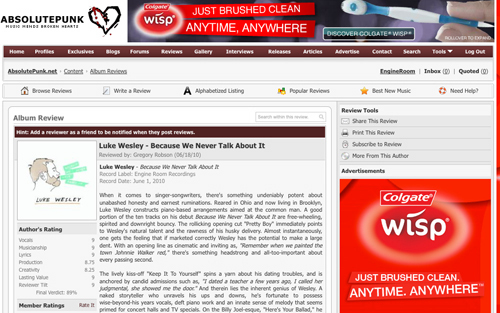 We just read a glowing review from Absolute Punk for Luke Wesley’s debut album “Because We Never Talk About It.” Here’s some of what they had to say about it “Artists like Luke Wesley come along once in a lifetime. Compelling, intimate portraits of honesty just aren’t that common, and those that are, aren’t nearly as mesmerizing as this. Never once does the album stumble, never once does it suffocate under the weight of its ambitions and never once does the disc leave one wanting more.” Wow! Check out the full review here. This entry was posted on Friday, June 18th, 2010 at 2:36 pm	and is filed under News. You can follow any responses to this entry through the RSS 2.0 feed. You can leave a response, or trackback from your own site.